Item # 298288 Stash Points: 2,799 (?) This is the number of points you get in The Zumiez Stash for purchasing this item. Stash points are redeemable for exclusive rewards only available to Zumiez Stash members. To redeem your points check out the rewards catalog on thestash.zumiez.com. Get top of the line protection from the elements without breaking the bank thanks to the Howl Daily Black Snowboard Mittens. These all black mitts feature a rubber enforced palm for extra grip on grabs and premium durability. Primaloft insulation keeps your hands warm without added bulk and the 10K rated water resistance ensures your hands are always dry. Finished with a 2-layer construction for added warmth and durability, these mittens have everything you need to rip all winter long. 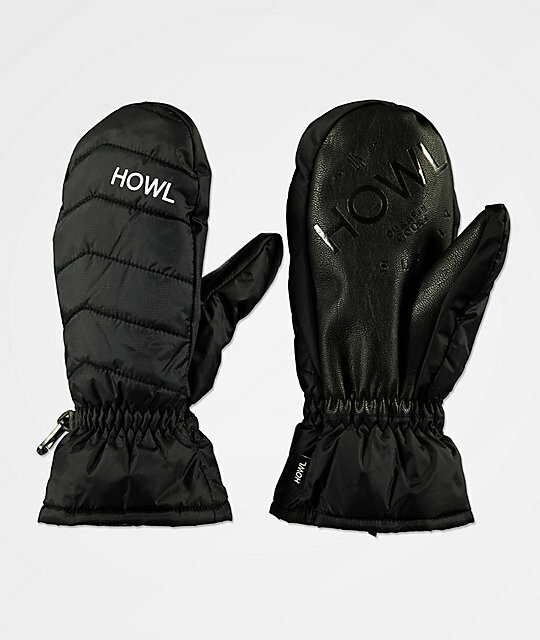 Daily Black Snowboard Mittens from Howl. 2-Layer durable 100% nylon quilted exterior treated with Durable Water Repellent (DWR) coating to prevent moisture saturation. Palm: Extremely durable PU & rubber reinforced palm with debossed logo & dual layer perforated panels. Primaloft: A low-bulk synthetic insulation that is warm, lightweight and soft. Warmth Index Rating: 2 out of 3 - Howl's mid rated mittens will be comfortable in a wide range of winter conditions. Waterproof 10K Hipora® Membrane: An extremely water-resistant, breathable, and thin insert provides unsurpassed moisture & temperature management. Cinched elastic outer cuff with internal elastic ribbed cuffs. Brushed tricot lining for comfort. Web wrist leashes + separate micro buckle connector clips for safe-keeping. Brand woven label on top of fingers.